Wednesday October 21st promised a day of total sunshine and clear visibility so there was little to discuss when we met at Chester le Street. It had to be the high hills where we could enjoy fine views and 90 minutes later we were parking in Gayle village next to Hawes. Our objective was a good stroll along the Pennine Way and a visit to Dodd Fell just off route as it was a 2000ft hill we had not climbed. It was the first day of winter in Gayle, but what a day with clear skies and a thick frost in all the places out of the sun. Without further ado it was over the roadbridge towards Hawes and then turning upstream past some attractive cottages alongside Gayle Beck and the West End to pick up the Pennine Way on the left of the lane. After one field you turn right and over a further two fields to emerge at tarmac. A few yards to the right and it is left again up Gaudy Lane for half a mile to the place where there is a barn and the entrance to Gaudy House which is a farm. Here you leave the track and get onto grass which is followed uphill keeping alongside the wall. At the first gate you reach open access land. The way ahead is clear and the path is not damaged over Rottenstone Hill and onwards upwards. The footpath eventually levels off and indeed descends for a short while before joining a bridleway on the right. This is Cam Road West. The route is alongside a wall with lovely views down into Snaizeholme Beck on your right. The bulk of Dodd Fell is in front of you just to the left of the Pennine Way. We decided to go up as soon as we reached the bottom rather than stay on the Pennine Way and this was a good decision as it is reasonably easy to gain height on several of the faint sheep tracks. The top is fairly level and wet so watch your feet when approaching the trig point. Although a modest height (and certainly Dodd Fell is a fell) the views were tremendous. To the south you look out to the edge of Pen y Ghent and the distant Pendle Hill. To the west is Ingleborough and Whernside and to the north Great Shunner Fell and Lovely Seat, whilst behind is Nine Standards Rigg and Wild Boar Fell. Looking east there is Addlebrough and behind the North Yorksire Moors. The Lakes were very clearly visible with the Langdale Pikes and Great Gable standing out. What a view and what a distance! When you ascend Newbiggin Common in Teesdale (another 2000 ft hill) you get a similar 360 degree view without the Lakes but as a bonus you can see Scotland and the Cheviots, and in both cases (and particularly on Newbiggin Fell) you can see over 100 miles! It was too wet to sit down on the summit so we headed south towards Pen y Ghent. The terrain was more akin to Bleaklow or nearby Yockenthwaite Moor but there are dry ways through and as you are looking down you can see them. After about 25 minutes you arrive at a wall where you turn left (east) and follow this to the corner where you turn down and in a short distance arrive on tarmac on the Cam High Road at North Gate. 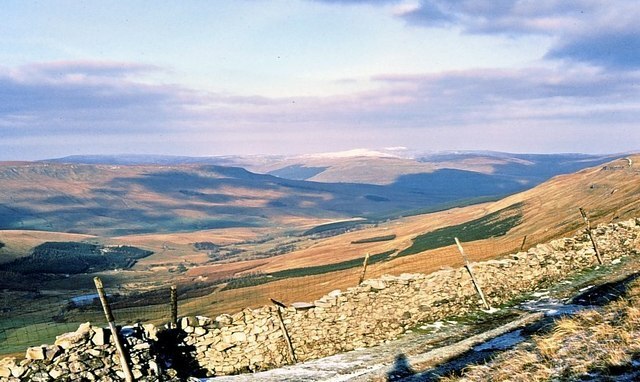 Cam High Road was developed by the Romans as a route from Ribblesdale to Bainbridge where they had a camp and years later served as a pack horse route. North Gate was decision point with three alternatives. These were (a) go east along Cam High Road all the way to Bainbridge and get the bus back to Hawes, (b) go east along Cam High Road and turn off to Buttersett and back to Gayle or (c) go west along Cam High Road to rejoin the Pennine Way and return to Gayle on another route. The latter route was chosen so that we could enjoy the fine views for another hour and a half. Cam High Road here is surfaced as it serves as the access road to Cam Houses and Cam Pasture which can be seen ahead in front of the forest. This is on the Dales Way which shares a short distance on Cam High Road with the Pennine Way. The valley on your left is the headwaters of the River Wharfe . It is over a mile on the Cam High Road before you come to the Pennine Way junction at Kidhow Gate and the junction is well marked. You now turn north on the Pennine Way with Dodd Fell on your right and the head of Snaizdale Beck on your left. This deepens rapidly to give a beautiful valley and a small lake set amongst woodland. You have about 3 miles enjoying this before you reach the junction where Cam Road West descends to the left and the Pennine Way ascends slightly. We had earlier came down that section but overall there is only about one mile on the Pennine Way which was walked earlier in the day. The views ahead down towards Hawes are attractive and just before reaching the A687 turn right into Bands Lane passing the farm. At the t-junction you can go either left and stay on the tarmac or better go right for a short distance to pick up the Pennine Way. At the end of the second field you leave the Pennine Way which actually misses out Gayle and go straight ahead on a good track over one field to come into Gayle and back to the car. This great day ended in the George and Dragon at Aysgarth where we all enjoyed a pint of George and Dragon beer brewed by Yorkshire Brewing which is a small but expanding brewery at nearby Askrigg and is brewed for the pub. This entry was posted on Saturday, October 1st, 2011 at 5:47 pm	and is filed under Other.